Idaho Department of Fish and Game data show pheasant populations are up 193 percent from last year. After little movement in pheasant populations in recent years, upland game bird numbers have spiked, said Randy Smith, wildlife manager for the Magic Valley region. Smith said it’s so far uncertain why pheasant populations are up so much. 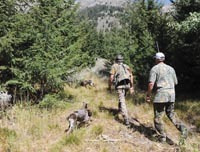 Archery season for Idaho big game began Aug. 30, as did hunting in some zones for predators and upland birds. Smith said hunters should have more luck this year because game numbers are up across the board for a variety of reasons. For example, he said, bears are finding less forage in towns because of education over the years by people like Magic Valley Region Conservation Officer Lee Garwood. As a result, fewer problem bears have been shot by Fish and Game officers. Smith added that although pheasant numbers are up, they are not what people found in the 1980s when there was a pheasant every mile as opposed to estimates today of a bird about every 10 miles. “(Hunters) would love to see those numbers, but there’s no way with the way that we farm these days,” he said. “It’s not conducive to high numbers of pheasants. Smith said the most abundant farmland for pheasant habitat is planted in alfalfa, but there are three and four cuttings a year now. “Farm equipment is much faster,” he said. “Harvesting every 30 days, so it’s hard for a pheasant to get a brood off. They’ll have a clutch of a dozen eggs or so, but it takes them over a month. They just don’t get the time. Smith said pheasants do best in farmland adjacent to permanent cover. Smith said other non-native game-bird populations such as California quail and Grey partridge are also up. Pheasants were introduced to Idaho in the 1920s when farming, irrigation and canal systems created good habitat for them and other upland birds. Early reports about native game birds like sage grouse, sharp-tailed grouse, ruffed grouse and forest grouse have been “pretty good,” Smith said. “Our officers have seen more than normal from the field this year,” he said. Bird hunting opened Aug. 30 concurrently with the big-game archery season. The big-game season for archery hunting, which is short-range and less effective than rifle hunting, generally runs through Sept. 30. Rifle season for elk and deer generally opens next month, though rifle season for bear, mountain lion and wolf also began Aug. 30. So far this season, nine wolves have been taken in Idaho, but none in the Ketchum and Sun Valley area. In the hunting units around the two towns one mountain lion has been taken for a total of three cats hunted so far this season statewide. Last season, of the 379 wolves taken by hunting (225) and trapping (124), nine were killed by archers “incidentally,” according to Fish and Game records. “The incidental kills were archery elk hunters that happened to also have a wolf tag in their pocket,” Smith said. He said deer and elk populations are looking pretty strong this season after last winter, which was fairly mild and light on snow. Smith said field observations suggest all big-game populations are on an upward trend. Last year, Fish and Game did a survey in the Bennett Hills south of Fairfield, where animals tend to trickle down from the mountains in the winter. Smith said the survey showed 23 percent more mule deer than in 2008 when the survey was last completed.